Among the most talked three international diet regimes at present are the ‘5 Factor Diet’ and the ‘Detox Diet’-it’s the ‘third’ that we will look at in depth. The 5 Factor Diet is not only a run for weight loss but a fitness program as well. It supposedly shows results in five weeks provided you eat five ‘healthy meals a day and follow five twenty five minute workouts per week’. The Detox Diet is a dietary regime that will also hopefully detoxify you! Short term in nature, you are required to withdraw from eating out -i.e no fried rice & chicken Briyani, Chop Sueys or Pizzas-or even the hot Kottu! You are also not allowed to take dairy products. And you will be able to consume soya based food, fruits, and vegetables since they provide fibre and water. Both 5 Factor Diet & Detox Diet as well as many other authoritative diet web sites, dieting systems (Eg: Atkin’s Diet) and books on dieting, readily recommend cutting back on flour, sugar and carbs, followed by switching to more organics with green leaves etc. All these diet systems are good-provided you can implement them in practice, but we cannot- due to our busy schedules, economic reasons and their impracticality to suit our lifestyles. The most important factor that make these diet systems less than effective (though they are not incorrect) is that their ‘one size fits all’ approach! In that, they assume that standard dietary prescriptions could be applied to anyone and will bring good results equally to all. But, ‘everyone’ is not made the same and people differ–men/women folks, by age groups, ancestry (Asian/African…) and in a multitude of other biomarkers. Let’s now look at the ‘third’ international diet regime that can cut across all of these and could practically help us-this is no less than the well kept ‘Hollywood Diet Secret’ for decades –dieting based on one’s blood type! We all know of the four main blood types (O, A, B, & AB) and by now, you almost probably know what your blood type is (According to medical science, in addition to these four, there are some rare blood types such as ‘RzRz’ for Alaskan Americans, ‘Jk’ for Pacific Islanders…and so on which are not important for this discussion). According to the Japanese, you blood type has a bearing on your personality. How should one go about consuming food –and even to lose weight- based on their blood type? The blood type O populace, ‘the carnivores’, are the oldest blood type in the world, and are “very comfortable” with red meat and other meats. Not only that they should go for meaty high protein diets, being a vegetarian can make them weak, leaving them ‘always hungry’. High endurance sports are the fastest way for them to lose weight. If you are a blood type A person is the vegetarian, you need lots of carbohydrates and meat items are not for you. Vegetables are best for you if they are raw or steamed, rather than cooked. Also, dairy products may not fit you well. Combining a dieting programme to simple exercises –such as outdoor walks-is their fastest way to lose weight. Blood type B is thought to have originated in Himalaya/Everest region and unlike O or B types, they need not only be either meat eaters or vegetarians but can balance their diets across the spectrum. More importantly, they are the only type that can enjoy dairy most (O, A and AB have differing restrictions on dairy-see chart). The bad news for B’s is that chicken is a definite no-no for them. Flour based foods and mixing pulses (various beans) with flour based food is the main reason for their weight gain. They should also avoid processed foods. 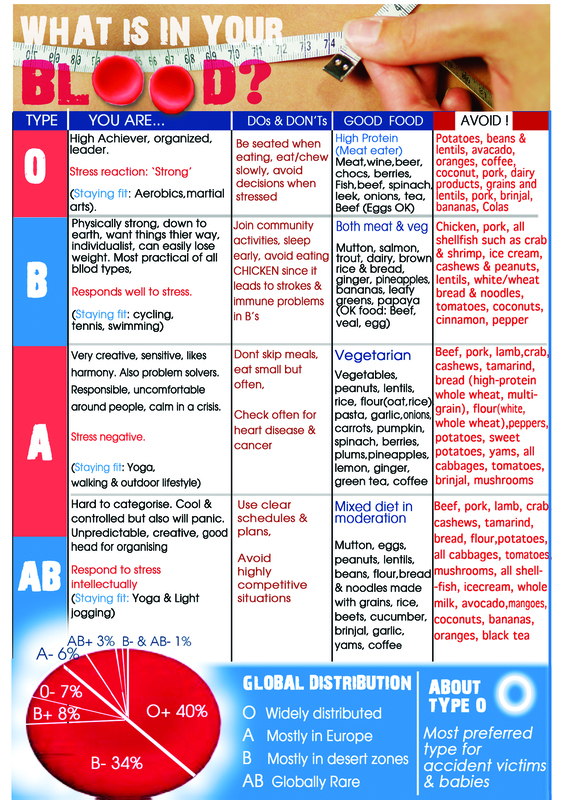 Blood type AB, the ‘lucky type’ can enjoy all the foods that A and B types can go for but equally becomes unlucky in a way since large number of prohibited foods for both A and B could equally weigh them down. Wheat is the main reason for their weight gain. It should be stressed that the ‘rhesus’ of the blood (the ‘positive’ or ‘negative’ Eg: ‘O negative’ or ‘O positive’ type) do not really matter when it comes to blood type diets. What is considered is only your generic type-O/A/B or AB. Though Dr. D’Amato’s approach has also been criticized as ‘not based on lab controlled experiments’, blood type diet systems are gaining an increasing following-and systems such as D’Amato’s have also been secretly followed by the Hollywood glitterati for decades. In fact, it is the blood type diet that worked (finally) for such Hollywood stars as Demi Moore, Cheryl Cole, Liz Hurley, Hugh Grant and Courteney Cox –all of them are now dedicated to this diet. Can one’s blood type biomarker decide on their destiny? It may not. But the blood type food/dieting provides the much needed departure point for an otherwise ‘one size fits all’ recommendation approach evident in the dieting and weight loss health sector –a sector which is increasingly gaining importance in our lifestyles. If correctly practiced, blood type diet may hold the key to our desires for better health–if not to the greater understanding of our very survival.